Instrument consists of three main parts: the illuminometer proper, a controller, and a reference standard. All are stored in a black case, dimensions of which are 42x25x18 cm. Also included in the case are various accessories, including three electrical cords. 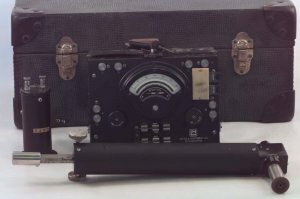 This device was used as a portable illuminometer. The illuminometer proper is a black tube, 23 cm long and 4.5 cm in diameter. It operates by comparing the brightness of a surface with a translucent lamp of known intensity at a variable distance within the illuminometer. One of the accessories within the case is a white test plate, with essentially constant brightness from all angles of observation. The scale of the instrument, at one end of the illuminometer proper, is calibrated in foot-candles, and the user standardizes it themselves to allow for the absorption of the surface. The controller consists of a battery for operating the lamps, a milliammeter for use with the standard lamps, two close-regulating rheostats, and a double-throw switch. The reference standard consists of a metal housing in which is mounted a standardized lamp. It is used, along with the test plate, to calibrate the illuminometer. H.A.E. Keitz. Light Calculations and Measurement. Macmillan and Co Ltd, London, 1971, p. 371. W.B. Boast. Illumination Engineering. McGraw-Hill Book Company, New York, USA. 1942, p. 48.